Easy to find on website very quick delivery great rice! 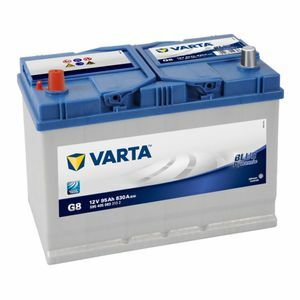 95Ah, 830CCA, for the same price you can purchase a battery elsewhere and end up with a much lower Ah and CCA rating. This is approx. my sixth purchase from Tayna, and I have always been delighted with the service. Great battery, delivery times and packaging. Thank you very much Tayna. Good product and very well packaged, although i ordered on a sunday and payed 8quid for 'next working day delivery' thinking i would recieve it monday. I didn't recieve it until tues afternoon. The tues delivery day option was only a couple of quid. If id have known 'next working day delivery ' wasnt 'next wotking day delivery' i wouldnt have payed a fiver extra for it. this is a good product , the Pirelli of batteries , 4 year warranty is great , last one I had lasted about 5 years ,very high torque for a battery of its size. just shy of 900 amp . Excellent service.Felt as though I was dealing with a local shop. Refreshing experience and cracking value for money. Seriously good starting power for my 2.5 tdi 4x4. This was an alternative offered by Tayna to replace the (Korean) original, and the fitments were almost identical. Very pleased indeed, by the quality of the battery and Tayna's (usual) service. Good company that has worked out the European market well and can deliver to continental Europe with a markedly better guarantee than other competitors. A pleasure to deal with this company ordered the battery and was delivered to my hotel a couple of days later.Packaged well .Good price. Good service, price and next day delivery The battery fitted fine, and very pleased. Fitted this as a starter battery on my boat and so far no problems. Looks exactly the same as the Bosch version but cheaper. Trouble starting with older battery, put this beast in and starts first time, every time. Refund processed on time. Good stuff. Quick delivery of excellent battery, for an amazing price, what more can be said -WELL DONE!